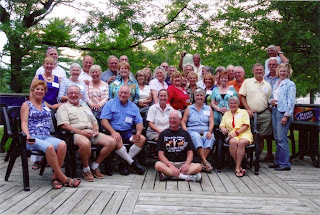 We came to Bay Moorings Marina in Penetanguishene to attend a "looper" get together, but arrived several days early. The marina is not really near the downtown area, so Joe rented a car for a few days. On Saturday, we went to the Jesuit Martyrs Shrine in nearby Midland. They were missionaries killed by the Huron Indians and many miraculous cures are associated with the Martyrs since their deaths more than 350 years ago. It is a pilgrimage site attended by people world wide. Unfortunately, it was quite crowded - mostly with kids and a pilgrimage from India. Joe attended a short mass and we both enjoyed seeing the unique church. He also talked to one of the Jesuit priests who had recently been with an old friend of ours from college who joined the priesthood. Small world - or small number of Jesuits! Every small town seems to have a few museums and a "recreated village." We had planned to visit Discovery Harbor, the recreated village, but weren't really into it. I had been disappointed that our cruise would not include Bruce Peninsula; since we had the car... After a late start, we only made it to the southern portion of the peninsula, but stopped at some great overlooks along the way. The water here is so clear and blue you might think you're in the Caribbean - until you feel it, anyway. The looper get together was a lot of fun and quite helpful. Tuesday night they had a wine and cheese social for us and then dinner on Wednesday evening which included a power point presentation of the Georgian Bay. Joe likens this part of the trip to going to a gourmet smorgasbord where you're allowed only one trip with a small plate. As usual, we didn’t come up with any firm plans, but we did get lots of recommendations on anchorages and routes – as well as those not use. Thursday, our planned departure day, started out rainy. By mid-morning we had decided to delay leaving by a day. Around 2pm the skies cleared a bit. Being ever flexible, we untied everything and left the marina. Looking back toward Penetanguishene and Bruce Peninsula, we got a preview of the areas that were to come. There are small, rock islands everywhere – many with cottages on them. The trees' growth is stunted by trying to grow on solid rock and often there are roots on the surface of the rock searching for nourishment. Many are also disfigured by the prevailing winds. Even with the number of cottages and boaters around, though, you can’t escape the feeling of being in a remote area. We only cruised for a couple hours before reaching a nice anchorage at Bone Island. Joe had finally broken down and paid for a fishing license so he wasted no time – and caught a nice weed. The next morning was gray again but we raised anchor and started out. The main channels here are well marked but often narrow and circuitous. O’Donnell Point is one such place that we’d been warned about. We came through without incident, but even though it was a cloudy day, we had a good bit of traffic to contend with. We’ve seen interesting lawn art – even though the lawns are rock. On the Trent-Severn we went through an area where several people had Easter Island statues. Joe got me all excited when he saw a family of seals on the rocks. I grabbed the camera, thinking that we hadn’t been expecting seals. As I took the picture, we had gotten close enough for Joe to realize that they were cleverly arranged rocks. They still look like seals, though. We anchored in Port Rawson Bay which is part of the Massasauga Provincial Park. You can anchor here without charge, but if you tie to a tree or rock wall there is a nominal fee. If you pay the fee, though, they’ll also take your trash! After we anchored the sun came out so we put the dinghy and the kayak in the water. I paddled around in the kayak for a while and we ended the day with happy hour on the fly bridge. Our plan was to anchor here for the weekend and do some exploring in the dinghy. First order of business on Saturday was to go buy gas for the dinghy. We killed two birds with one stone on that trip. Everyone had recommended that we eat at Henry’s, which claims to be world famous. Since Henry also sells gas, we went there and had lunch. Fish and chips – pickerel, which is walleye – were quite good. The sky darkened as we made the dinghy trip back to Carolyn Ann, but the rain held off until we’d gotten back. Not deterred by the weeds, Joe finally caught his first fish - a northern pike. A $50 fish dinner! We spent the weekend with rain and clouds for most of the days. Late in the afternoon, it was apt to clear up, so I got a little kayaking time in. Young America joined us there on Sunday and we enjoyed an evening visit with Fred and Linda. Our plan had been to leave Monday morning, but the rain was coming down again and the generator didn't want to start. Joe spent some time on the phone with technical support and got the generator working - still not sure what was wrong - but the rain was still coming down so we decided to stay another night. Tuesday morning we and Fred and Linda were ready to head out to Parry Sound, the largest community on the eastern shore of Georgian Bay at a population of 6,500. Along the way we came to another one of those narrow channels between the rocks. Young America squeezed through behind us. We managed to tie up at Big Sound Marina just before the rain poured down. The brief shower ended in time for us to make the short walk to the Charles W. Stockey Centre for the Performing Arts. We attended a concert featuring Paul Stewart, a well known Canadian pianist, and the Leipzig String Quartet who tour worldwide. The Stockey Centre seats 500 and claims to have perfect acoustics. It was certainly surprising to find such a place in this remote area. The concert was great; Joe and I especially liked the string quartet. Before they started to play, the cellist explained their attire - they were casually dressed. They'd flown in from Tokyo the day before and a bag had been lost. The lead violinist was wearing a T-shirt advertising the Parry Sound Festival of Sound. The cellist explained that in the interest of unity, the rest had decided not to wear tuxes either, although one had shiny black shoes on. The lost bag had also contained the music that they were scheduled to play, but the substitute piece was great. We parted ways with Young America for a while when we left Parry Sound. They had decided to cross the bay to Bruce Peninsula, while we took the more traditional route through the 30,000 islands. Our next stop was a nice anchorage in Hopewell Sound. I toured nooks and crannies in the area in the kayak - peddling this time. Later Rocky joined me for a short paddle. We started out early the next morning because Joe had an ambitious day planned. The first part of the journey took us among the islands again and then out into Georgian Bay at Pointe Au Baril. In the old days the fishermen would put a barrel on the rocks with a lantern on top to help them find their way into port - so they pointed the bow to the barrel. It was a nice sunny day, though the bay was frisky. The weather forecast promised that the seas would lay down around noon. The thing about those forecasts is they don't come with a guarantee. We had a pretty uncomfortable day - not scary, just uncomfortable. We were rewarded with a beautiful anchorage in Beaverstone Bay. We're sometimes reminded of the southwest landscape - if the water were sand! The last day of July (happy anniversary John and Meredith!) was to be our last day in Georgian Bay. What a way to end! Beaverstone Bay led us into Collins Inlet which proved to be the most spectacular part of the journey so far. It is a deep natural cut through granite walls. We actually had sun again and from the fly bridge I took more than 100 pictures in about 15 miles. The variety of colors and shapes in the granite are just amazing. Also, the mere fact that all those trees manage to grow. A couple feet above water level there is a color change on the rocks - and has been all through Georgian Bay. The water in the lakes, although recovering, is well below the historical high levels that left the line.